It's official. Yorkshire is a World Champion venue when it comes to cycling. Indeed, the county will be hosting the World Road Cycling Championships in Autumn 2019. 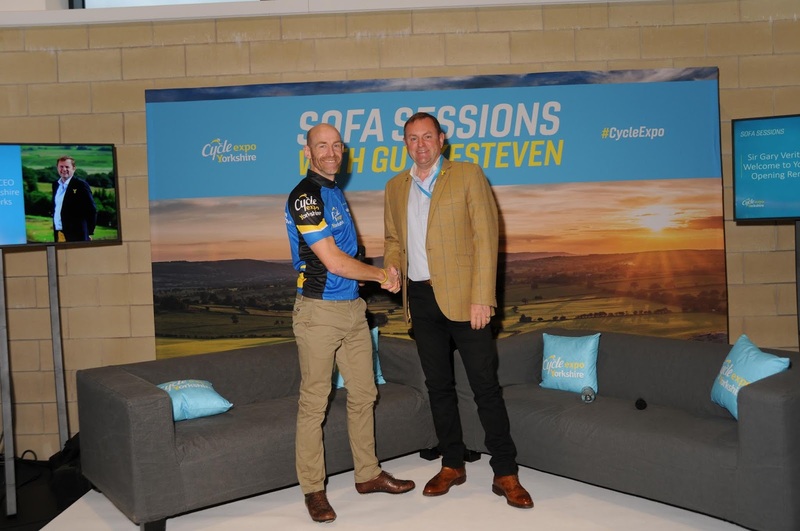 Just like when the Tour de France came to Yorkshire in 2014, Harrogate will once again be the focal town as most of the races will go through or finish in the Yorkshire spa town. 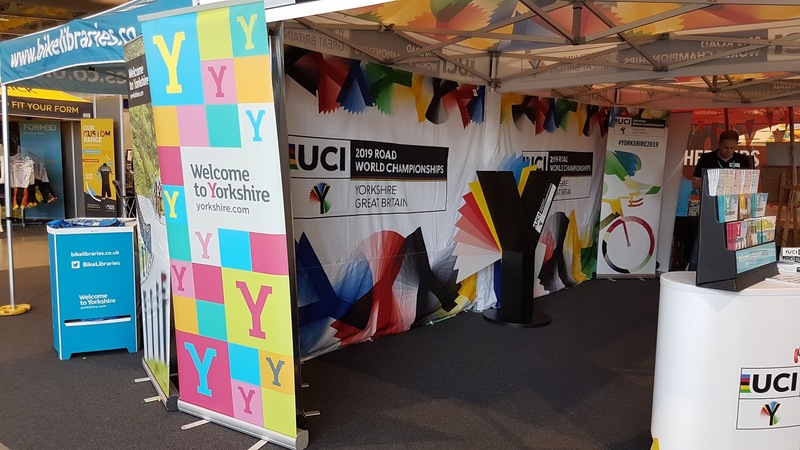 The countdown has begun, and as part of it Yorkshire hosted its first cycle show, Cycle Expo Yorkshire, at the site of the Great Yorkshire Show, in Harrogate. I wasn't able to get up to the press and trade day, but I did go on the Saturday and Sunday, and quite a few high profile folks had turned out for the occasion, including Lizzie Deignan, fresh from having her first child; Shanaze Reade, who has come out of BMX-ing retirement to reinvent herself as a track cyclist; Canyon-Eisberg road racer Andy Tennant; Mr Yorkshire himself, Sir Gary Verity; and Ruby Isaac showing off her amazing tricks on rollers at the grand old age of 10! I managed to get a few words with Sir Gary Verity about the expo and the upcoming World Championships. His interview now forms part of a feature I wrote for Rouleur website. Part 2 of it will come out in a few weeks. I also spoke to Lizzie Deignan for an interview feature for Rouleur. In between interviews with the different guests and presenters I checked out the Yorkshire Event Centre, looking at what was on offer, while meeting different people. It was good to see, albeit briefly cycling presenter and author, Ned Boulting. I also got talking to the husband of artist Lucy Pittaway, who has been the official artist for the Tour de Yorkshire for the past few years. 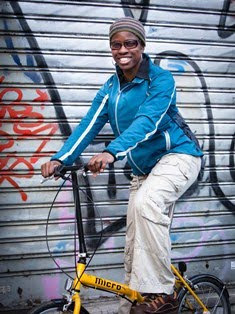 Although she's not big on cycling, Neil is. So it was good to chat with him about the highs (literally) and lows of cyclosportives and riding events like the Etape du Tour, which he has ridden a few times. Lucy Pittaway had some lovely paintings on show, notably the one of the riders going up through Haworth, and the signature painting from this year, of the infamous Park Rash. They are doing cycle themed calendars too, which I look forward to hanging up on my wall in 2019. Also at the show were test tracks around the grounds to try out various types of bikes including off-road manual and electric bikes. I didn't test out any bikes but I did ride around the grounds during a cyclocross race. It was a good call having one round of the Yorkshire Cyclocross league at the event, and I made the most of the opportunity! Until this cyclocross race all my previous races had been in dry, sunny conditions. 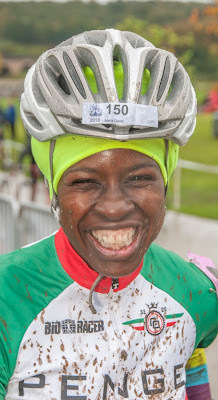 But this was the day where I would break my proper cyclocross duck (at least for the first time in about five years). Looking at Sunday morning's torrential rain it was the easiest thing in the world to say, "I'll stay at home and ride the turbotrainer." But somehow it felt weird saying that in relation to cyclocross. Cyclocross means grey, muddy, rainy days. That is good cyclocross weather! Racing in the sunshine on dry, dusty, bumpy trails is not good. Your bones are rattled all over the place, you get massively dehydrated... why would you want to race in those conditions?! That was how I tried to convince myself to race, though I wasn't fully convinced myself - especially because when I told folks I'd be doing the cross race I was met with replies like "rather you than me" or "you're such a brave thing." Anyway, I went through the motions of getting ready and drove from my base in Kettlewell, over to Harrogate. My morning had been spent doing a trail run, and I had managed to escape the rain. As soon as I arrived in the rainy car park and saw the various riders either getting ready to race, or covered in mud from having raced I felt convinced that I should get out there. Regardless of their situation they all looked very matter-of-fact about the conditions. No one seemed bothered by the torrential rain. It's probably a Northern thing, and there was no way I wanted to act like a Southern softie! So I got on with the business of racing too. A bit of tarmac provides respite from the mud bath known as cyclocross! It wasn't a wasn't a massively technical race, but there were a few sections that caught me out in the increasingly boggy conditions. Running across an adverse camber, locally known as the "Yorkshire Wall" was not at all easy, and was the scene of one of my more spectacular crashes - right in front of a sizeable crowd. There was also a mini bombhole, which had a small pool of accumulated rain. As long as you got good momentum on the descent it was possible to clear it without putting your foot down, even if you did get a bit of a soaking. I had to use my core muscles to the max as the bike slid around, and it felt like I was in the lap of the Gods as to where I would end up. Luckily I didn't crash at that point at all during the race. I just crashed everywhere else! I didn't know any of my other female competitors, but I got to know a couple of them afterwards - notably the ones I'd been sparring with throughout the race. There was one woman that I constantly swapped places with at different points. I was able to get around the corners and up the short sharp hills quicker than her, but she was better on the fast, non-technical sections. She was also better than I was at staying on her bike. I crashed at least five times, and things got decidedly tricky as the mud was more and more churned up, and it became very slippery. Towards the end of the race I was falling down just while walking with the bike. Also my bike began to suffer and the last thing I wanted to happen was for my rear mech to snap, so I just slowed things down and gently twiddled my way around my final lap, crossing the finish line in a muddy mess, but happy to have made it through. Needless to say, my erstwhile opponent had gained even more ground on me, and I had to accept that as all part and parcel of racing. 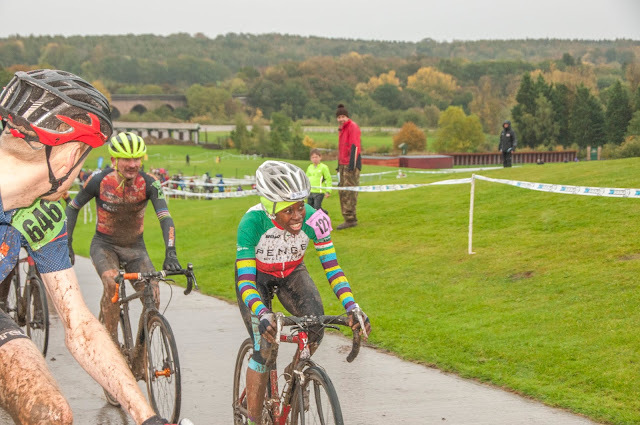 I hope to get to another cyclocross race in Yorkshire - maybe we'll have a return match. As a reward I bought myself a UCI World Championships bobble hat, as I felt like a champion, having soldiered on through the difficult conditions. Back to the Expo where I had a final look at the various stands before heading back to London. As a first Expo in Yorkshire I think it went well. They had been expecting around 200,000 visitors. I have no idea how many did go. The weather on Saturday had been forecast to be pants, but it wasn't. Sunday's wet weather didn't look like it had deterred the visitors. Cycle Expo Yorkshire was probably about a quarter of the size of the Cycle Show at the NEC. I could imagine it getting bigger, in the same way as the Cycle Show has done. I remember a few years ago when the Cycle Show was held in a hall at the Business Design Centre in Islington. Then it just grew and grew, moving to Earl's Court, and now it's scaled the heights to being at the National Exhibition Centre. 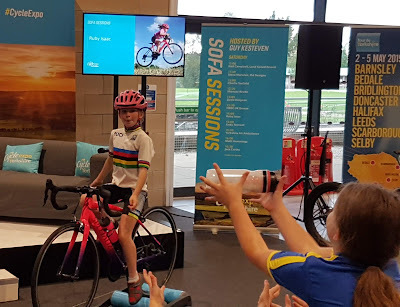 Cycle Expo Yorkshire will be a pretty big deal next year, as it will be taking place at the same time as the World Championships, so I expect it will be heaving at that time, as people descend on Harrogate from all over the country, and beyond. I'm looking foward to it.